Experimental Biology with Micro-organisms: Students' Manual talks about micro-organisms and examines facts and different relevant studies. 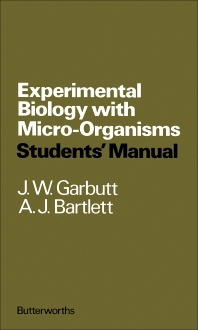 The first part of the book discusses handling, culturing, and observing a micro-organism; this part also explains the importance of such practices when dealing with the said subject. Also mentioned in this part are the nutrition of the micro-organisms and the explanations regarding autotrophs and heterotrophs and what complex food they manufacture or utilize. The book also presents a background on the life cycle of the organisms, such as bacteria, chlorella, slime molds, yeast, Mucor hiemalis, and Basidiomycetes. In Chapters 4 and 5, the book talks more about an organism's growth and genetics, along with some of its subtopics. The succeeding chapters focus more on the environment's effect on organisms. The book ends with an analysis of the different interactions. The book caters for people who are studying biology and acts as a great reference for bio research.